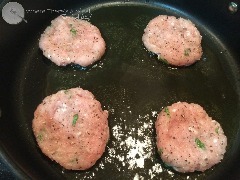 Combine lean ground turkey, garlic powder, onion powder, fresh basil, salt, pepper and olive oil and mix together well. Once meat is mixed, using your hand, score the meat to make 8 equal burgers (Rachael Ray gave this tip one day on her show and I have to say this is the easiest way to insure you have the same size burgers). 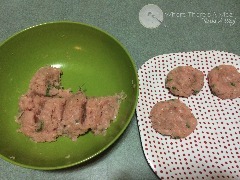 When making the burger patties, make the middle thinner than the outer edges so that the burger will cook evenly and stay flat, as the center tends to plump as it cooks (also a Rachael Ray tip). Heat olive oil over low/medium heat. Cook burgers for 3 minutes per side. While burgers are cooking, heat the rolls in the oven as directed. Once burgers have fulled cooked, place on a plate lined with paper towels to drain off any excess oil. Slice dinner rolls in half. 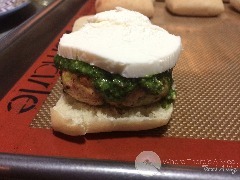 Place burger on bottom half, and spoon each burger with a spoonful of pesto and cover with a slice of fresh mozarella cheese. Place in oven at 375* for 5-10 minutes or until cheese is soft. 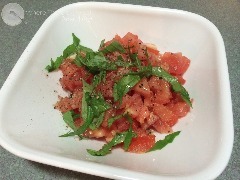 To make the bruschetta, dice the tomato into small chunks and mix with olive oil, fresh basil, garlic powder, salt and pepper. Mix well. *Need fresh basil? One of the best food investments I've made is spending $3 at my local farmer's market for a basil plant. I've enjoyed handfuls upon handfuls of fresh basil for a fraction of what it would cost at the grocery store. 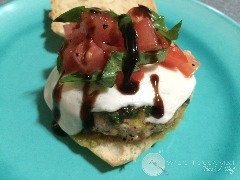 Spoon bruschetta over the finished burger. Drizzle the balsamic glaze over the burger and enjoy! 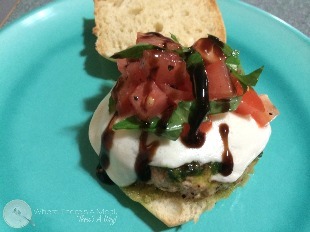 The first place I ever had a bruschetta burger was at a local restaurant called Tribeca Tavern. Let's just say that the balsamic glaze blew my mind! After about the fourth or fifth time that I made Joe go get takeout from there, I figured there had to be a way to make something like this at home. I decided to make them slider size because I like to use frozen ciabatta rolls as my bread and they also fit Tucker's hands a little easier. It was a success! Have a favorite food at a restaurant, but don't feel like eating out? Try making it at home because where there's a meal, there's a way! This burger recipe is sure to have your football fanatics "running back" for more! 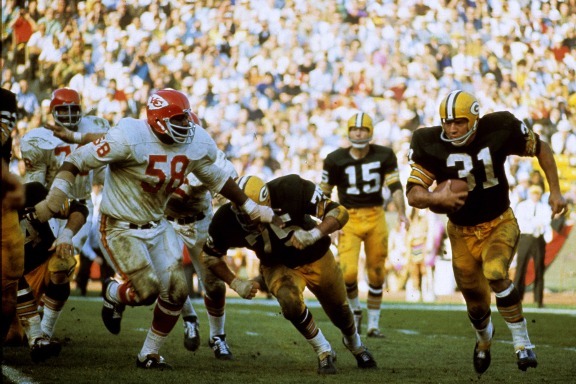 Here are some Throwback Thursday facts about the very first Superbowl. Yum---I wil be trying these!